Owens Corning® EcoTouch® Certified R Metal Building Insulation is a light density fibrous glass blanket. EcoTouch® Certified R is labeled with both a pre-laminated and post-laminated R value. 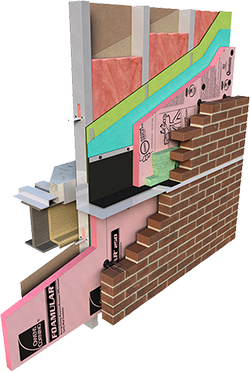 Owens Corning® Enclosure Solutions deliver a range of options for commercial walls, roofs and below-grade foundations - all with customizable components to fit your project, and all backed by the experts at Owens Corning. Easy to handle and laminate. Length, - 0" / + 1/2"
Width, - 1/8" / + 1/8"
The surface burning characteristics of these products have been determined in accordance with UL 723. The standard should be used to measure and describe the properties of materials, products or assemblies in response to heat and flame under controlled laboratory conditions and should not be used to describe or appraise the fire hazard or fire risk of materials, products or assemblies under actual fire conditions. However, results of this test may be used as elements of a fire risk assessment which takes into account all of the factors which are pertinent to an assessment of the fire hazard of a particular end use. Values are reported to the nearest 5 rating.